I’ve spent the last eight years working with addicts in varying degrees and roles. It’s been a joy and a challenge, but I’ve learned on dominant thing in that time: most explanations of causation and for recovery are too simplistic. Most explanations and proposals simply don’t understand the complexity of change, but Carlo DiClemente does. 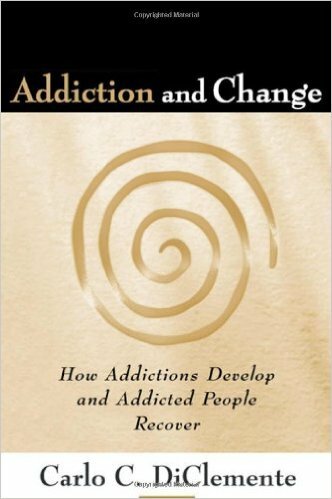 His work in the Trans Theoretical Model of Behavioral Change (TTM) has helped to unpack much of that complexity, and in Addiction and Change he applies it to all addictions.This is a much-needed critique of the singular explanation approach to addiction treatments. So, while DiClemente explores the various models of addiction and change, and is able to note their respective strengths, he does not believe any singular model sufficiently explains addiction and change. Each model overlooks vital elements in the process of change. In lieu of this he proposes a model of change that is diverse, and incorporates various aspects of each of the singular models. It is broad enough to allow this room, yet still narrow enough to be relevant to the discussion of change. The TTM views both addiction and recovery in terms of a process of change. Both are an attempt to make changes to our lives, for better or worse, and both follow the same general path, with obvious appropriate variations to the details. Change, according to this model, happens across five stages: Precontemplation, Contemplation, Preparation, Action, and Maintenance. Each has various challenges and developments to them which allows DiClemente to recognize the strengths of the other approaches. The book walks readers through the process of change both into addiction (the first half of the work), and out of addiction (the second half of the book). It provides a comprehensive exploration in change unlike any other volume on this subject that I’ve read. It is also full of references to direct source material. DiClemente shows his work and backs up his claims with extensive research. Yet, despite all its interaction with clinical research, the volume is surprisingly accessible. It interacts well with academic research but without getting bogged down in technical jargon or the minutia of debates. This is a fantastic volume for those working with addicts. Many of his conclusions support the claims of biblical counselors as well, though there will be some points of tension. The usefulness of the book, however, is in its pushback against the dominant interpretations of addiction. DiClemente is not afraid to critique the sacred cows of addiction treatment and care. He is careful to note the strengths of various approaches, but does not shy away from their failures. This has been perhaps one of the most insightful and useful books on addiction treatment that I have read to date. I highly recommend this volume to counselors and addiction treatment professionals.